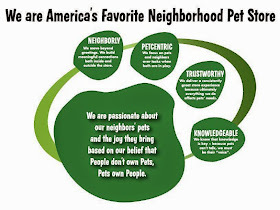 Pawsitive Impressions: Trustworthy, Pet-Centric, Neighborly No-Growl Return in Appleton, Wisconsin Results in Happy Neighbor! Trustworthy, Pet-Centric, Neighborly No-Growl Return in Appleton, Wisconsin Results in Happy Neighbor! I am so happy about my visit last night. I have been having problems with my Treewalker's dog food because she has a very sensitive stomach. I have tried many brands and have back on forth with her on the bland food diet. My trainer recommended to switch to a lamb formula but I was bummed that I had two full bags of different types of food we tried. Last night I brought them in to see what they could do for me and to my surprise they exchanged one of the bags for the new food I wanted, and gave me an in-store credit for the other food that didn't work out. I was also happy to hear that the food that did not work for my dog was going to get donated. Thank you for allowing us to have this option if the food doesn't work for our animals! Happy customer right here!